As I mentioned in my last fishing report, I've been interested in getting a kayak. Well, I am now kayak-enabled. I had a false start with a really nice used kayak off Craigslist, but that deal fell through due to a flaky, and in the end a bit creepy, seller. No big deal, I ended up buying new since prices are favorable in winter. I have christened her the SS Guacamole for obvious reasons. The boat I chose, the FeelFree Corona, doesn't come in colors that I find particularly aesthetically inspiring, so I went with high visibility which is not a bad idea for a small, low-slung boat on the large reservoirs that she'll spend most of her time. So if I'm not nuts about the colors, then why did I choose the Corona? Several reasons. First, it was within my budget parameters. I didn't have a lot of wiggle room on that. Second, I liked the size and versatility. Even though the Corona is considered a "tandem", at 13' and with a capacity of 617 lbs, she can reasonably accommodate 3 people and there's even a molded location and fittings for a third seat. So I can safely take both of my kids fishing. In fact, I could probably squeeze my entire family on her but that wouldn't be very comfortable. The seating can be configured for 1, 2, or 3 people, so when I want to fish with one other person, or all by myself, I can and it won't make the boat unbalanced. The third reason is that of all the tandem kayaks that met my price, size, and capacity requirements, the Corona seemed like the one that would be the most manageable for a single person to load and transport. That's key because my wife is not supposed to lift heavy objects, my kids are too young to be of much help, and I envision doing a fair amount of solo fishing. FeelFree's signature "wheel-in-the-keel" feature enables a single person to pick up the fore end and roll the kayak around easily. Of course, with a cart you can add that capability to any kayak, but having it built-in means you don't have to worry about where to store the cart when you get to the water. Also, the Corona has very robust molded-in handles, which I think are lot more comfortable, durable, and secure than the bolt-on handles on most kayaks. Combine all that with the right storage and transport systems, and that makes for a big boat that can be safely managed by a single person. I had an extra bicycle hoist so I used that for storage as you can see in the picture. 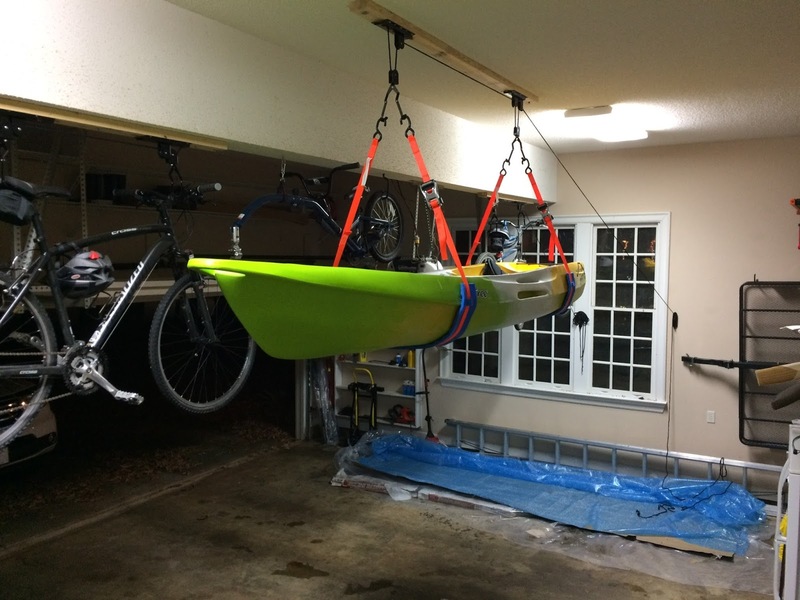 A hoist is ideal for single person operation as opposed to lifting the kayak onto a rack or shelf system. The hoist's capacity is 100 lbs, which is 25% more than the kayak weighs and the straps are rated at 1250 lbs, so there's enough capacity buffer in the system that it should be safe. I found a helpful page on the web that gave the optimal distance between the suspension points because if you don't get it right, you can warp the kayak over time. On the hoist, there are two claws attached to movable pulleys. The claws were designed to hold a bicycle up by the seat and handlebars. They were originally bent at 90 degrees, which is fine for a bike but didn't seem very safe for a kayak. I tried to replace the claws with stainless steel quick links but I couldn't attach them to the pulleys without major surgery. So I ended up simply bending the claws upward to ensure that the strap hooks don't slip off of them. It wasn't easy because the claws were quite heavy duty and hard to bend. But it worked and it's a simple and effective solution. I also threaded some closed-cell foam pads onto the straps to keep them from deforming the kayak. Hanging the hoist was a pain because my garage ceiling is so high (I had to rent a taller ladder from Home Depot) but I completed it last night. For the Guacamole's first night in the hoist, I parked the cars outside and suspended her only a few inches off the ground in case there was any sort of infant mortality failure with the hoist or my installation. For transport, I bought a Yakima SweetRoll carrier. Once again, I needed to be able to load and unload the boat by myself. The SweetRoll has rollers on the rear supports, so you can to pick up one end of the kayak and put it up on the rear of the car, then pick up the other end and relatively easily push the kayak into place on the carrier using the rollers. I'm going to get a cheap rug to put on the back of the car to prevent scratches and I'll clip a safety rope from my car's rear towing hooks to the back of the kayak to keep it from rolling away on its wheel-in-the-keel when I have the fore end lifted onto the car. I haven't done it yet, but I've watched several videos, and this should all be doable by a single person. Still, she's an 80 lb boat, so it'll be a little workout every time I do it, which isn't a bad thing. I just need to remember to lift it properly in consideration of my middle aged back! Now I need to do a little rigging on the Guacamole to get her ready for fishing. Short-term that only means a few rod holders and an anchor trolley. But longer term, I'd like to get a fish finder. I don't want to get carried away with rigging because I want to minimize weight and complication for transport. So I'm going to keep it simple. The Guacamole will really open up lakes and rivers to me in ways I could only dream about when bank fishing and I'm just waiting for a reasonably warm day to get her out on the water!